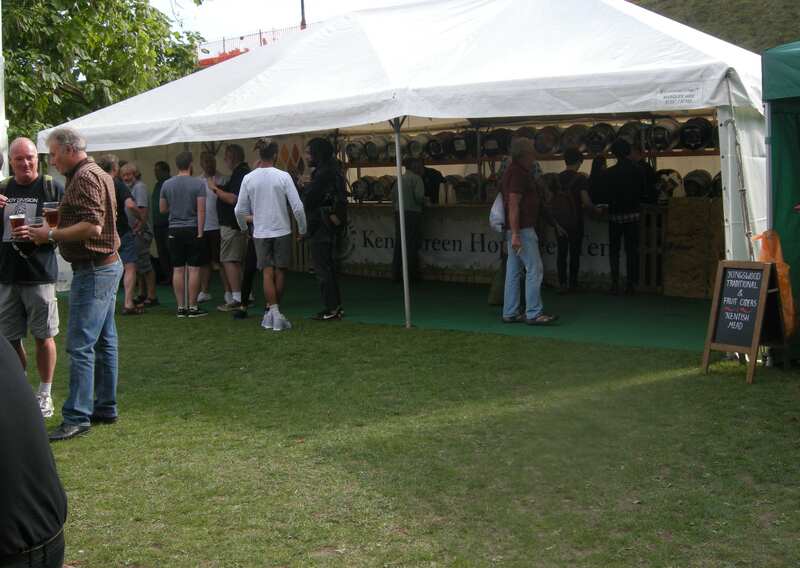 Our tent at Canterbury marks the official start of Kent Green Hop Beer Fortnight, but I have the feeling that for some it is the Fortnight. There’s always such a good atmosphere and plenty of familiar faces year-after-year. This year it seems you loved the beer more than ever. You got through 800 pints on the Friday! Gadds’ Green Hop Ale (4.8%) is always the first cask to sell out – which is why we always have several casks of it – but the next to go this year was Old Dairy Fuggles (4%). Everyone seemed to agree it was delicious. You’ll have to seek this one out in pubs across the county now, or one of the brewery’s KGHB events, as we only had one cask of it for Canterbury. I’ll whet your appetite by telling you it’s a light, delicate and very drinkable brew with honey and lemon hop flavours against the restrained sweetness of a malt backdrop reminiscent of brown sugar. Absolutely worth hunting for. 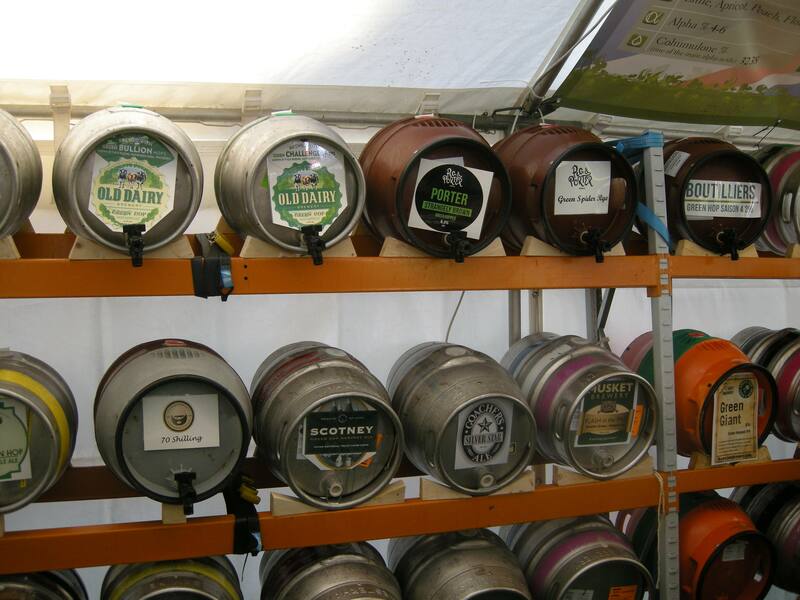 We have many other delicious brews at Canterbury Food & Drink Festival this Saturday (24th Sept). Here’s a flavour of what’s on offer. *Bexley Brewery Berry EKG pale ale (4.1%) has an enticing perfumed, floral aroma threaded with lemony notes leading you in to a zesty beer with honey notes. One that really evokes the summer sunshine. East Kent Green Hop Collaboration (5%) This collaboration between Gadds’, Canterbury Brewers/The Foundry, Canterbury Ales, Wantsum and Goody Ales tastes stunning. It’s super zingy, light and lemony. A juicy sherbet lemon of a beer! It’s hopped mostly with EKG along with a smidgen of Bullion – which here exhibits stone fruit notes rather than the blackcurrant it can offer up. Because it’s a green hop the flavour is delicate but the taste will please fans of American craft beers (but won’t put off traditional/British ale fans). Wantsum Brewery Bullion (4.5%) poured much darker than I was expecting and has a pronounced spicy blackcurrant aroma and flavour with hints of chocolate. I bet it would taste great with a nice bit of venison! Boutilliers Green Hop Saison (4.2%) Joining KGHBF for the first time Boutilliers have made a rather traditional saison. The aroma is of saison yeast with a hint of lemons. It’s a dry, snappy beer with more lemony notes emerging as you drink. I think it would be a good one to have with salmon or a dish like lemon chicken. Pig & Porter Strangely Brown (4.8%) is much the same dark but light delight as it was last year. The green hops lift the malts so you get all of the flavour and body in a exceedingly drinkable beer. Expect lots of chocolatey flavours with a hint of lime. We’re back at Canterbury today. The Food & Drink Festival is in Dane John Gardens. It’s free to get in. Opening times, 10am – 6pm. Find us at the foot of the mound – more directions here. See you later for a beer! (See below for a couple of corrections to the beer list). 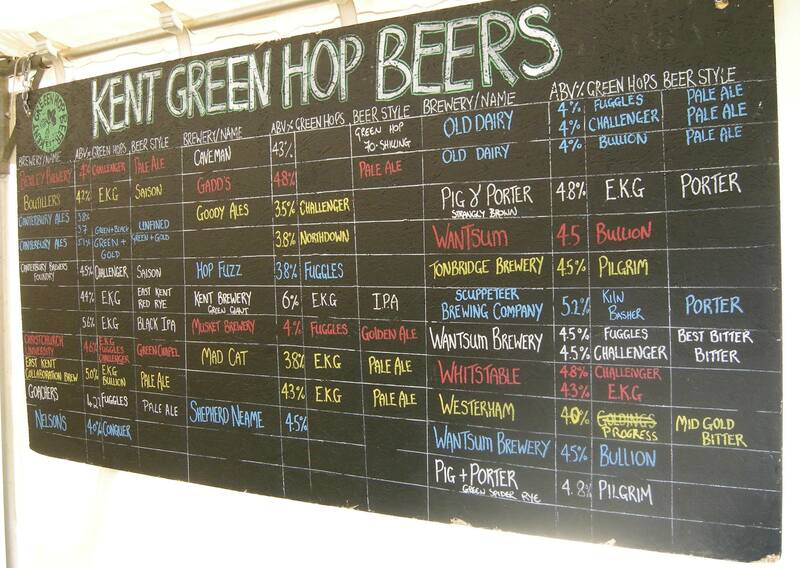 Bexley Brewery *Instead of those listed we have – Berry EKG pale ale 4.1% (see tasting note above). Pig & Porter Instead of Purest Green we have Green Spider Rye. Wantsum In addition to what’s listed we have their Bullion.